Leading Indian shuttler Saina Nehwal clinched the women's singles crown in the China Open Super Series but compatriot Kidambi Srikanth grabbed the headlines by pulling off the biggest upset of his career when he beat two-time Olympic champion Lin Dan to win the men's singles title in Fuzhou on Sunday. Newly crowned China Open champion Kidambi Srikanth Sunday “gifted” his Super Series Premier title to India's chief national badminton coach Pullela Gopichand on his 41st birthday. Skipper Virat Kohli led from the front with a gritty unbeaten century as dominant India completed a resounding 5-0 whitewash over Sri Lanka by winning the fifth and final One-day International by three wickets. It is like a marriage in your neighbourhood; you can watch the song and dance as long as you want; but you have not been invited to the feast. However grand it may be, in the end, the only feeling that lingers is that of denial. South Africa paceman Morne Morkel thrived on a fast WACA pitch to capture five wickets but the tourists made hard work of a three-wicket victory over Australia in the second One-day International in Perth on Sunday. Morkel's return of 5-21 was his best in One-day cricket and helped skittle Australia for a paltry 154 runs from only 41.4 overs on a day of brilliant sunshine in Perth. Rashid Khan produced a strong back nine performance to win the Chiangmai Golf Classic by one shot for his second Asian Tour title on Sunday. Trailing overnight leader Thanyakon Khrongpha of Thailand by two strokes, the 23-year-old carded a four-under-par 68 in the final round to finish on 17-under. Delhi Dynamos extended their dismal run in the ISL as they lost by a solitary goal to Kerala Blaster to remain at the bottom of the table and put themselves in a difficult position to qualify for the semifinals. A lot can happen in the coming days at the World Chess Championship, underway at Sochi in Russia, even though reigning champion Magnus Calsen is leading against Viswanathan Anand. A mouthwatering finale to the season ended before it even began on Sunday when Roger Federer was forced to pull out prior to the ATP World Tour Final showdown with Novak Djokovic. While sixth seeded Saina won her second Super Series title of 2014 by overcoming Japanese Akane Yamaguchi 21-12, 22-20 in 42 minutes, Srikanth stunned the five-time World Champion Chinese 21-19, 21-17 in 46 minutes at the Haixia Olympic Sport Centre. Srikanth, on the eve of the summit clash, had said that it was his childhood dream to play 'Super' Dan in a final, that too in his own backyard. Come Sunday, he not only fulfilled his dream but went one step better by ousting the legendary Chinese in straight games to earn his first win in three outings against Dan. I m very happy to win this title, my third in the season. It is one of the toughest. I have been working really hard for the last few months and I am extremely happy that my efforts bore fruit. Vimal sir helped me a lot and it is a huge victory and a great feeling to win the title in China. Srikanth, ranked No.16 in the world, took off well by going into a 9-4 lead in the first game. However, Dan, in his usual style, took time to get into his rhythm before closing the gap at 15-all. It was neck-and-neck till 19-all but Srikanth held his nerve to take the next two points and bag his first ever game against Dan, arguably the greatest ever shuttler. The second game was a tighter affair with Dan also coming out with tougher competition. However, the Indian youngster matched the Chinese great to take it to 15-all. The 21-year-old Hyderabadi, just like the first game, came out with his best strokes just when it mattered the most to clinch six of the next eight points and earn the biggest win of his career. "Great wins! It is fantastic for both of them and Indian badminton. For Srikanth, it was a big match and at the end of it he kept his nerve to earn the big win. Overall, he has played some high level badminton throughout the tournament," said chief national coach Pullela Gopichand. Earlier in the women's singles final, Saina totally dominated her World No. 35 Japanese opponent in the first game. At one point the World No. 5 Indian took seven successive points to take a 15-7 advantage. It was only a matter of time before Saina sealed the game in her favour. However, the 17-year-old Akane upped the ante in the second game and Saina had to come out with her best to keep the Japanese in check. The Indian was given a scare when the unseeded Akane reached game point at 20-19. But Saina doused the lead and won the next two points to bag her first China Open title. "To beat Lin Dan in a final is a dream come true. I just played my 100 percent because there was nothing to lose. Before coming here, I was playing well. When I beat my compatriot R.M.V. Gurusaidutt in the first round, I felt confident because it's always tough to beat a player who knows you well. 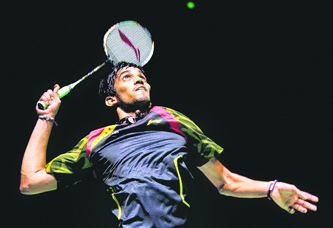 I just wanted to win each round that I played," said the 21-year-old Srikanth. "As I got close to a second game win, I just told myself to focus on the next point, since I have lost a few matches while leading. Today's my coach Pullela Gopichand's birthday, so this title is a gift to him," said Srikanth. Opting to bat, Sri Lanka rode on their skipper Angelo Mathews' unbeaten 116-ball 139 to put up a challenging 286 for eight at the JSCA International Stadium Complex before Kohli (139) guided India home with eight balls to spare. Kohli struck 12 fours and three sixes during his 126-ball knock as India boosted their confidence ahead of the upcoming tour of Australia. A screaming Kohli sealed the issue by hitting Mendis for a six over long-on after completing his 21st century, the fourth this year. Incidentally, Mathews too scored the same number of runs in setting up a respectable score but the day belonged to his Indian counterpart as India geared up to the Australia tour before the World Cup with a memorable series triumph. Chasing a fighting 287, India looked in firm control with Kohli and Rayudu (59 from 69 balls) putting on 136 runs for the third wicket, but the latter was unfortunately run out, triggering a mini collapse. Lanka almost forced a twist in the tale after Mendis (4/73) claimed the wickets of Stuart Binny and R Ashwin in successive deliveries as Kohli remained stranded at the other end. The collapse that began with Rayudu's wicket meant India lost five wickets for 81 runs but Kohli held his nerve and took on Mendis, stepping out to hit a big six and a four to turn the match in India's favour. Champions Tennis League, which promises to be the first big spectacle in India, is also being pitched as a great opportunity for youngsters. How it is going to promote tennis at grassroots level is completely inexplicable. There is only one positive visible at the moment and that is the game may get more popular in the country due to big players coming to India. There is also hope that youngsters watching the matches may get inspired by the big names. “Until you give the current crop of players a chance to play with big names, you can not expect to take their game to the next level. It is good that a start has been made in India. Top players will at least come to India and play here. That’s about it,” said a Chandigarh-based coach. The scheduling of the tournament with 13 matches in 10 days spread across six cities makes it a roller-coaster ride. Time and again, the USP of the tournament is said to be its domestic nature. However, Saketh Myneni (Pune Martahas) is from Andhra Pradesh; Sanam Singh (Delhi Dreams) is from Chandigarh; Ramkumar Ramanathan (Bangalore Raptors) lives in Barcelona and has roots in Chennai; Jeevan Nedunchezhiyan (Hyderabad Aces) is from Chennai; Somdev (Punjab Marshalls) lives in US. Clearly, the connect is missing with every team. The two domestic players who will travel with every team, but not play, too are not necessarily from the same region. The sincerity with which the franchisees pursued the local talent is evident when a CLTA player, who is arguably the best player (U-16) in the region, says, “I do not know when, where and how domestic players were selected.” He is not alone but the sentiment gets echoed in players’ response, time and again. Champions Tennis League will be held across six cities (Mumbai, Hyderabad, Delhi, Pune, Bangalore and Chandigarh) from November 17 to 26. This is the first big ticket event for tennis in India, bringing international stars on one platform. It aims to raise the profile of tennis in India and giving Indian players a chance to rub with the best in the world. Six teams have been divided into two groups for the double-leg — home and away — preliminary round with the winner of each group contesting the final in New Delhi. Each tie comprises one-set matches in five categories — legends, men’s singles and doubles, women’s singles and mixed doubles. The first to reach six games is declared the winner of a match even without a two-point advantage, while a nine-point tie-breaker will be enforced if the score reaches 5-5. The winning team will pocket the top prize of Rs 1 crore while the runners-up will get Rs 50 lakh. Australia's innings began disastrously, with Morkel having the dangerous David Warner caught behind for a duck before the same bowler caught Aaron Finch for eight at mid-on off the bowling of Dale Steyn (3-31). Shane Watson (11) and Steven Smith (10) also went cheaply before George Bailey (25) and Australia's top scorer Mitchell Marsh (67) steadied the innings with a 58-run partnership. Rashid Khan produced a strong back nine performance to win the Chiangmai Golf Classic by one shot for his second Asian Tour title on Sunday. Trailing overnight leader Thanyakon Khrongpha of Thailand by two strokes, the 23-year-old carded a four-under-par 68 in the final round to finish on 17-under. 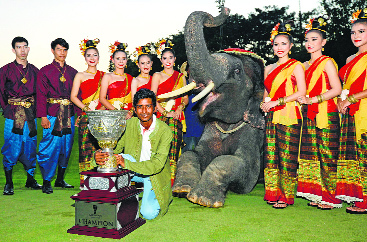 Thanyakon (71) and Khan's compatriot Jyoti Randhawa (69) finished tied for the second spot. Khan was trailing by three strokes after the Thai started with a birdie on the opening hole but he kept his composure and picked up four shots in six holes from the ninth to climb back in contention. “This win is really special because it is my second win this year and first outside of India,” Khan told reporters after his victory. “It was a really good week. I recovered very nicely on the back nine. I was confident with my game and I played very well on the back for three days. So heading on the last few holes, I was very confident I could win the tournament.” The 24-year-old Thanyakon, eyeing his first Asian Tour win, had a roller-coaster round during which he mixed four birdies with three bogeys. Second-half substitute Penn Orji scored the all-important goal in the 61st minute as Kerala notched up their third win in nine matches to jump to the third spot in the league standings. Delhi made as many as six changes in their starting line-up from the one that lost against FC Goa in their last match. Captain Alessandro Del Piero was on the field after sitting out a match but it was the same old story for the home side as they slumped to their fourth loss. Del Piero had his best day on the field since the start of the league but the other forwards failed to fire. The Italian legend was on the verge of scoring his first goal of the tournament through a running header in the 39th minute off a fine cross from the right by Junker. “The games in the coming days will be evenly fought. Carlsen will continue to play for a win,” said world No.23 and Indian Grandmaster P Harikrishna, adding that Anand still has a chance. World No.7 and Grandmaster Anish Giri said that “so far Anand seemed still somewhat shaky but Carlsen didn’t look at his best either, as was clear from the last game”. “When you don’t expect a gift, you don’t look for it,” Anand had said after the sixth game. 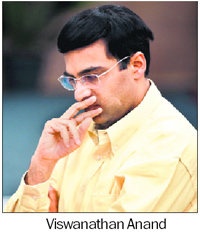 The Grandmasters were of the view that Carlsen was perhaps feeling the pressure of Anand’s playing style. According to Ramesh, if Anand loses one more round then it could be said the match is over. “Anand is in a difficult position right now, he has to forget about the blunder, have a good rest and bounce back with fighting chess,” Giri added. With 3.5 points at the end of the sixth game, Carlsen has a one point lead over Anand. The 33-year-old Swiss, who spent nearly three hours late on Saturday beating compatriot Stanislas Wawrinka in a gruelling semifinal, announced his decision on court as the O2 Arena filled up for the expected final. Federer, who was bidding for a seventh title at the year-ender, apologised but said he was not “match-fit” after developing a back problem. “I hope you understand I wanted to come out personally and excuse myself for not playing ... I can’t compete without a back at this level,” he told the crowd who still warmly applauded, despite their obvious disappointment. ATP president Chris Kermode, standing alongside Federer, then announced that Andy Murray, who failed to qualify for the semifinals after being thrashed by Federer on Thursday, would play Djokovic in a one-set exhibition match instead. Aditya Verma, the petitioner in the IPL spot-fixing scandal, has claimed that BCCI’s president-in-exile N Srinivasan committed contempt of court by attending the Asian Cricket Council meeting. Verma, secretary of the unrecognised Cricket Association of Bihar, also alleged that the BCCI’s decision to call an emergent working committee meeting on November 18 is illegal. “Despite being clearly told by the honourable Supreme Court that he should not act as the BCCI president till further orders, Srinivasan had gone and attended the meeting of the Asian Cricket Council in Dubai on November 7 as the ‘president’ of the BCCI,” Verma said in a statement. “The honourable Supreme Court has already revealed there are prima facie evidences against him in not one but two reports of Justice Mudgal Commission. The court has already served notice on him for act of “misdemeanour” relating to cases of betting and match-fixing in the Indian Premier League (IPL),” he added. Bharat Petroleum Corporation Limited, Bangalore lifted the All-India Bombay Gold Cup Hockey Championship trophy by dethroning holders Indian Oil, Mumbai, 10-9 via sudden death in the final here today. The scores were tied 5-5 at the end of the regulation time and 8-8 in the tie-breaker when BPCL goalkeeper Swinder Singh rose to the occasion by making three remarkable saves in the deciding penalty shootout. First, he did well to foil Vikas Sharma and Dharamveer Singh’s attempt and later, in the sudden death, he thwarted the dangerous Gurjinder Singh to clinch the issue in his team's favour.